Got tomatoes? Me too! Nothing tastes so much like summer as a beautiful, ripe tomato. Now, I do love a caprese salad (tomato, basil, fresh mozzarella) as much as the next person, but you might not want all that cheese at times. (I know, I can’t believe I said that. OK, maybe you just don’t have fresh mozzarella on hand right now. I bet you have an onion, though.) Anyway, regardless of the reason, here’s a flavorful, healthy dairy-free option that will delight your tastebuds! Slice your veg: The first thing you should do is sharpen your knife! Seriously, someone should test the tensile strength of tomato skin. I do not know why it is so hard to cut it with a knife, but it is my secret test for whether a knife is truly sharp! I like to cut the tomato in half from stem to bottom, cut out the core, turn it so the flat side is down, and slice 1/8″ thick. I used a sashimi knife for this (super-sharp Japanese knife with one beveled side and one straight side) but any sharp chef’s knife will do. Slice your onion thinly , too. 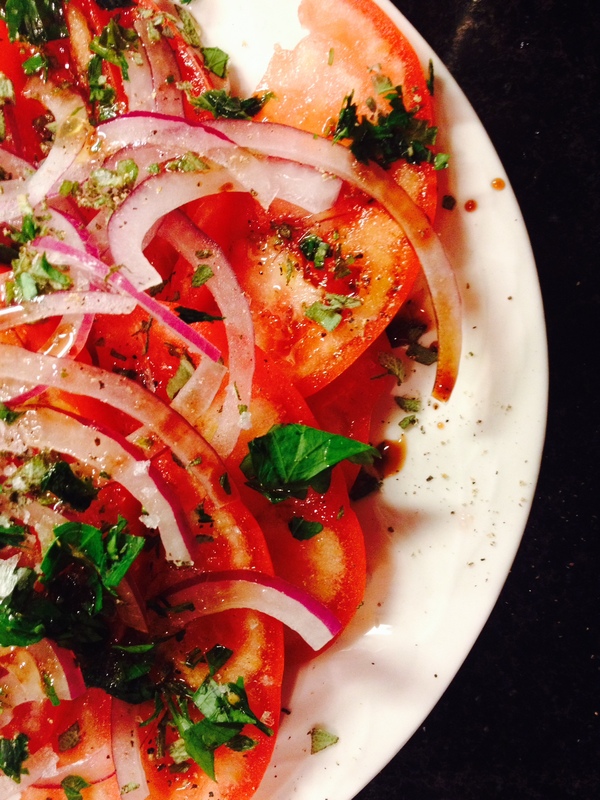 The thinner the onion, the prettier your salad will be! Assemble your salad: Layer your tomatoes in a pretty ring around your plate. Scatter the thinly sliced onions over the top. Sprinkle flaky sea salt and freshly ground pepper over the whole thing. Sprinkle your chopped or torn herbs over the top. Drizzle the whole thing with olive oil and balsamic. Now let it sit while you make the rest of dinner… The salt will bring some of the juices out of the tomatoes, which will blend with the olive oil and balsamic and make your salad super yummy! Enjoy!